Mobile sources are primarily on-road motorized vehicles including cars, trucks, buses, and motorcycles. They also include non-road equipment such as construction equipment, recreational vehicles, small-powered equipment, marine vessels, and locomotives. These mobile sources contribute to airborne emissions of harmful pollutants; including carbon monoxide, particulate matter, hydrocarbons, and nitrous oxides. 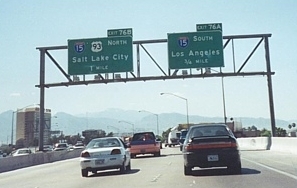 Nevada's major population centers (the Las Vegas valley and the Reno-Sparks area) suffer the effects of heavy vehicle usage, including air pollution. The focus of the Mobile Sources Program is to develop and implement strategies to control air pollution from motor vehicles in Clark and Washoe counties where these large cities are located. The goal of the Mobile Sources program is the reduction of tailpipe and evaporative emissions from on-road vehicles. Gasoline- and diesel-powered vehicles of all weights are regulated. Three major programs (see below) are currently in place: vehicle emissions inspection and maintenance (smogcheck) in Washoe and Clark counties; random roadside testing of heavy-duty diesel vehicles; and a program requiring alternative fueled vehicles in government fleets. Some of these programs are managed jointly with the Nevada Department of Motor Vehicles (DMV). This program was developed jointly with the Nevada Department of Motor Vehicles (DMV), Emission Control Section and is administered by DMV. It's purpose is to reduce motor vehicle related pollution through the inspection and emissions-related repair of motor vehicles. Emissions testing is required annually in Clark and Washoe Counties, where Nevada's high population centers are located, to renew a vehicle registration. All gasoline powered vehicles must be tested, as well as diesel powered vehicles weighing up to 14,000 pounds gross vehicle weight rating (GVWR). See the DMV website for more information. The Heavy-Duty Vehicle Program was developed jointly with the state Department of Motor Vehicles (DMV), Emission Control Section and is administered by DMV. Its purpose is to reduce motor vehicle related pollution by limiting excessive tailpipe or smokestack smoke from any vehicle, diesel or gasoline, with a manufacturer's gross vehicle weight rating (GVWR) of 8500 pounds or more. This program is being implemented in Nevada's high population areas, but applies throughout the state. Heavy-duty vehicles are pulled over for random roadside testing to determine if the exhaust from their vehicle exceeds state opacity (smoke) standards. Violators are notified and are required to repair and retest the vehicle within 30 days. Fleets may also request opacity testing in their fleet yard. If violations are found, fleet managers are notified and vehicles are voluntarily repaired and retested.